Penguang (centre) flanked by Bakrie (left), Dr Cheong (right) and Ivy look at the some of the provisions in the new consolidated by-laws. KUCHING: The new Local Authorities (Dog Licensing and Control) by-laws 2018 is limiting the number of dogs per property to three dogs for landed properties or one small breed dog for flat and apartment properties. In a press conference today, Assistant Minister of Local Government Datuk Dr Penguang states that all dog owners will now be required to obtain licenses for their dogs. Under by-law 4(1), once the license has been issued, it will be valid for three years. The licensing fee for sterilized dogs and unsterilized dogs are RM30 and RM90, respectively. Unless otherwise approved by local authorities, by-law 9 limits the numbers of dogs per property and specifies higher licensing fees are higher for additional dogs. The licence fees for additional dogs are RM90 for sterilized dogs and RM270 for non-sterilized dogs. Additionally, there is also a provision in the new by-laws that state that any unclaimed dog that has been seized from the streets and impounded after 48 hours will be put to sleep. “Such seized dog shall only be released to the owner upon him or her paying impounding fee of RM50 per day or part thereof. Any unclaimed dog shall be put to sleep,” said Dr Penguang. He added that all the 26 dog licence by-laws in Sarawak have been consolidated into one law for purpose of uniformity and consistency in the licensing and control of the local dog population. Tabled and approved by the Sarawak Cabinet on Oct 18, the by-laws will come into force effective Dec 1, 2018. Dr Penguang explained that the main purpose of the new by-laws is to help the state better cope with the current geo-environment circumstances that prevail around the people of Sarawak. He said the Ministry had chosen to amend the B=by-laws simply because they wanted to have only single by-laws for the whole state. He noted that before this all the 26 local authorities in Sarawak have their own dog licensing by-laws, with each council imposing their own fee at different rates. “We all know there is an outbreak of rabies in Sarawak, which leads to an urgent need to control the population of dogs, especially the stray ones. 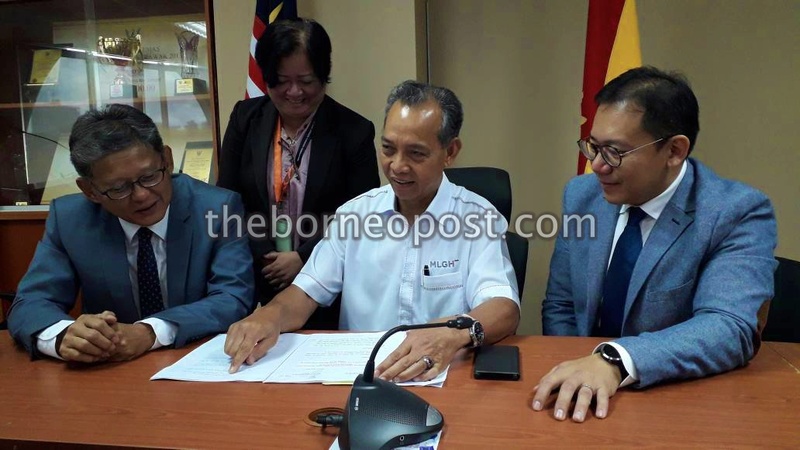 “This by-law aims to consolidate and harmonise the existing dog licence by-laws, which will be applicable throughout the state of Sarawak,” he said. The 26 local authorities are: Council of the City of Kuching South; Kuching North City Hall; Miri City Council; Sibu Municipal Council; Bintulu Development Authority; Padawan Municipal Council; Serian District Council; Simunjan District Council; Kota Samarahan Municipal Council; Ban Dism’ct Council; Lundu District Council; Sri Aman District Council; Lubok Antu District Council; Betong District Council; Saratok District Council; Sarikei District Council; Maradong dan Julau District Council; Sibu Rural District Council; Kanowit District Council; Dalat and Mukah District Council; Matu and Daro District Council; Marudi District Council; Subis District Council; Limbang District Council; Lawas District Council; and Kapit District Council. Ministry of Local Government and Housing permanent secretary Bakrie Zaini, head of public health Dr Cheong Yaw Liang and principal assistant secretary of the Legal and Policy Unit Ivy Suli Untup were also present at the press conference.